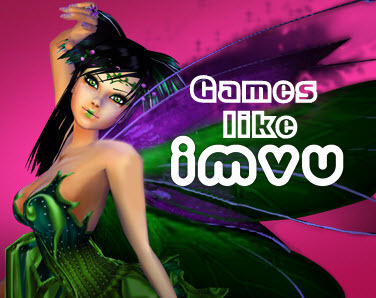 Check these recommendations for online virtual world games like imvu. IMVU (Instant Messaging Virtual Universe) is an online 3D virtual game which allows its members to communicate with eachother through 3D avatars. IMVU has more than 100 million registered user accounts worldwide and features the largest user-generated virtual goods catalog of more than 10 million items. Kaneva is a 3D Virtual World that supports 2D web browsing, social networking and shared media. Kaneva allows millions of people to explore, interact and create their own worlds. You can make a virtual world or a 3D MMO Game World. Meez is the online virtual playground for teens to create social and multimedia activities to share with friends. Users also can create a personalized avatar for use both in Meez's Virtual World and other online social networks. It is meant to be a virtual three dimensional representation of the user. Visit Official website Here. The Sims 3 is a 2009 strategic life simulation computer game developed by The Sims Studio and published by Electronic Arts. It is the sequel to the best-selling computer game, The Sims 2. It was first released on June 2, 2009 simultaneously for OS X and Windows both versions on the same disc. Club Penguin, ........if you can think of more, then don't forget to mention it in comments.